Lou Gehrig was both an amazing man and one of the most incredible athletes of all time. Gehrig came into this world in a big way, weighing in at 14 pounds at birth. He was the lone survivor of four children, the other three dying of childhood illnesses. In Gehrig’s teens, his family moved to Manhattan. Gehrig was a dual sport athlete, playing football and baseball. Scouts first saw his potential during a high school game when Gehrig hit a grand slam out of Wrigley Field. This type of power was unheard of in a seventeen-year-old player. Although Gehrig was un-drafted in baseball, a New York Yankee scout was watching him strike out seventeen batters on a day his team lost. He was not as impressed with his pitching as much as his left-handed power hitting. He had been watching Gehrig for some time and was enamored with his towering home run shots. The Yankees signed Gehrig to a contract in 1923, and he played in the minors for two years and excelled on every level. Within a few years of becoming a Yankee, everyone knew Gehrig was a special kind of player. 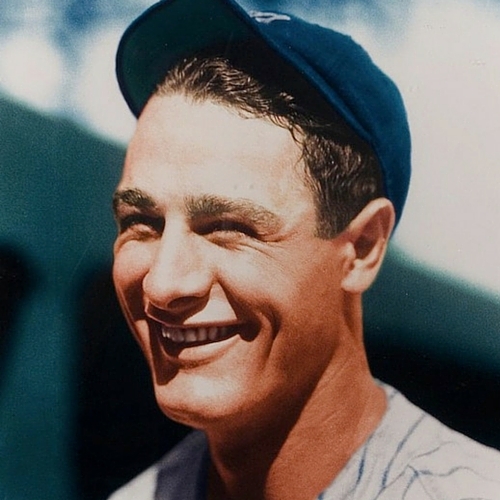 Lou was the consummate professional; his longtime manager Joe McCarthy stated that Gehrig never caused any problems and showed up to play hard every day. On most lists, Gehrig is rated the sixth or seventh best baseball player of all time. He would probably be considered number one on the list if his wonderful career had not been cut short by disease. He won the Triple Crown, six championships, and had the best 11 year run of any player in the history of the game. From 1927-1937, he averaged 153 runs batted in, 38 home runs, 38 doubles, 11 triples, and had a .657 slugging percentage. He scored an average of 141 runs scored, played an average of 154 games a year, 577 at bats, averaged .349 and had an on base percentage of .458. Gehrig was a six-time champion, the only player in history to collect 400 bases in five different seasons. Gehrig’s greatest assets were his work ethic and attitude. He played through broken bones (seventeen hand fractures during the streak), concussions, and the flu. For the majority of his career, Gehrig was overshadowed by Babe Ruth’s greatness, but later they became the most formidable tandem in the history of the game. Most years, the two hit more homers than almost every team in the league. Babe Ruth is considered the greatest player of all time, and he is also left-handed. A comment by Gehrig’s mother generated a feud between Ruth and Gehrig that lasted until the time of Gehrig’s amyotrophic lateral sclerosis (ALS) diagnosis. Gehrig’s Consecutive Game streak may have been broken by Cal. Ripken Jr., but Gehrig’s streak ended because of disease, not lack of athletic ability. Cal Ripken was a great player, but his stats during his streak pale in comparison to Gehrig’s. In 1938, it became apparent that Gehrig was in decline. His numbers plummeted and his manager was at a loss to explain it. He had seen players hit the wall—lose their skills, their bat speed, and their ability to hit the ball. What was puzzling was the fact that Gehrig’s timing was fine, he saw the ball clearly, but his power was gone. The Yankees manager was almost in tears when Gehrig announced he was quitting baseball. Gehrig was a fan favorite, and seeing their hero struggle physically was hard for everyone to endure. On the day he said goodbye to his fans, Babe Ruth and Gehrig embraced and ended their feud. In his farewell speech, Gehrig said he was the luckiest man on the face of the earth. He will always be remembered as the original Iron Man. He was the first athlete to ever have his number retired. He was almost immediately inducted into the Baseball Hall of Fame after his retirement. Baseball’s greatest dynasty lives on, and Lou Gehrig will always be a big part of Yankee tradition. Lou Gehrig—a man who considered himself lucky even when faced with his own demise. Hats off to Gehrig, one of the most athletically talented Southpaws who ever lived.